We met in the lobby at 8:50 am for our tour of Paris. We had a large, comfortable bus and our guide, Vincent, did a very good job. It is not my preferred method for seeing a city, and I don’t recommend it. I would not actually even consider this “seeing” Paris – that Viking says it is is a huge stretch (as is claiming this is “Day 2”). If it is the only way you can see Paris, then you will certainly be able to tell people you looked at the major sights. Most of the pictures I tried to take from the bus weren’t even this good – so no Paris “Tour” pictures. 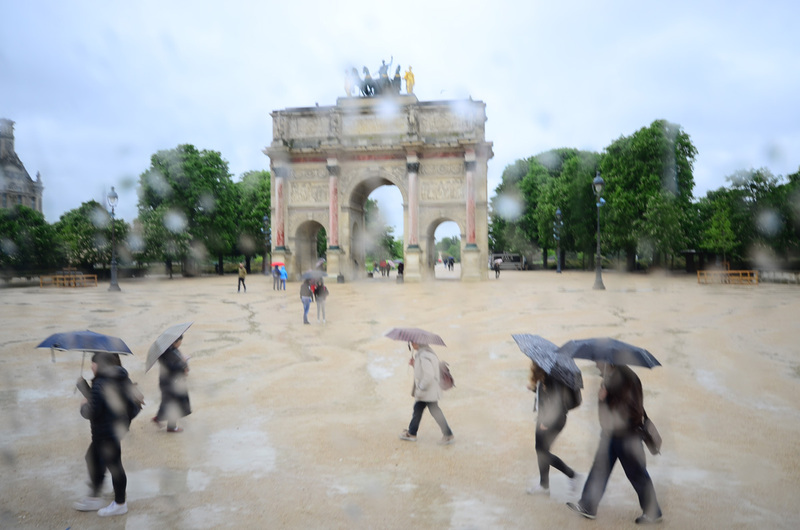 First up was the Arc du Triomphe (no surprise as it is close to our hotel). We drove around the rond to look at it from all sides; then drove down the Champs Elysées to La Concorde, the la Madeleine, L’Opéra and the Louvre. It was the 1st of May, a holiday in France, so the streets were relatively traffic free and we could move about easily in our huge bus. Near L’Opéra, crowds were gathering and we could see large numbers of armed police. The Le Pen family has two rallies planned for today, promoting their Nationalist agenda. Our guide was not at all reticent about warning us of the dangers the Le Pens present with their message – anti-Semite, anti-immigration – echoes of the intolerance that wracked Europe leading up to the Second World War. We continued our route around the city, again and again seeing evidence of crowds gathering, some in opposition to the Nationalists, at least. 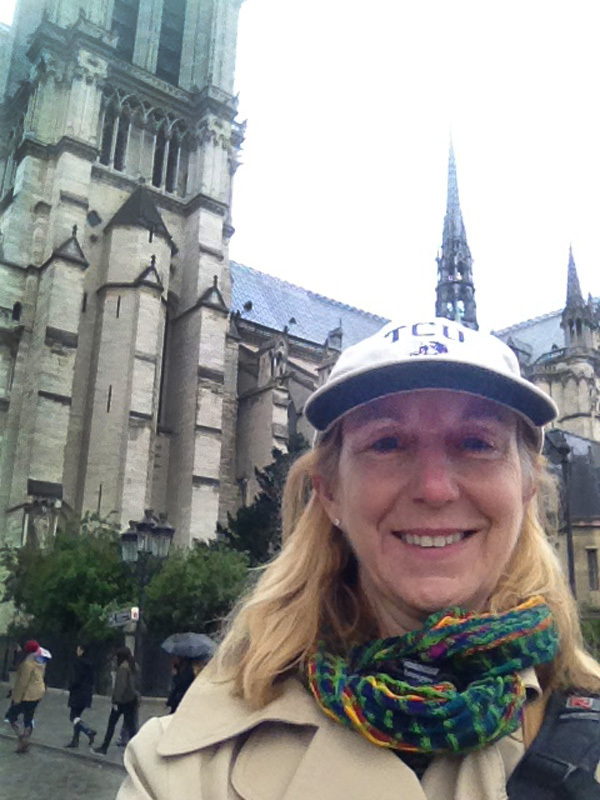 We drove to the Hotel de Ville (City Hall) where we got out of the bus in order to visit Notre Dame. The guide walked us across the bridge, and left us in the huge square in front of the cathedral. Joanne and I got in the line to go in for a visit. We were joined by Judy and Rod. The line seemed long, but it moved very fast. There was simply a bottleneck, the line squeezing down to single file, but no entry fee nor bag search. Inside, the cathedral was full of tourists and it was hard to get up close to anything. 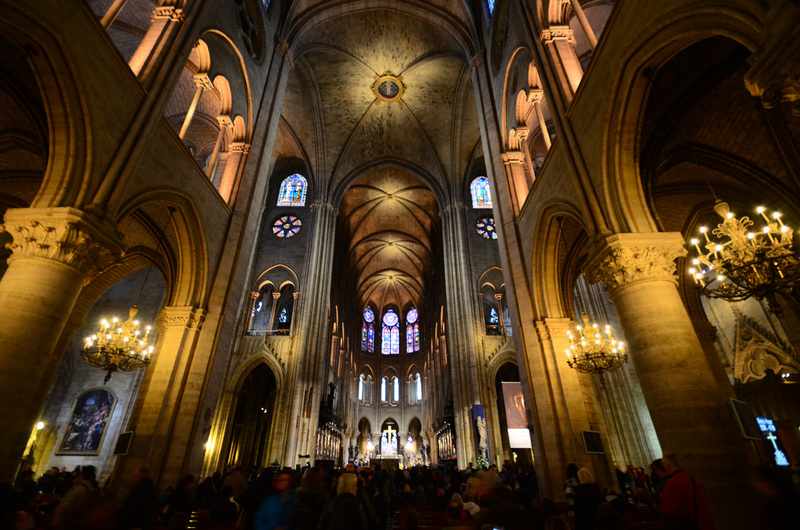 Nevertheless, is there anything more inspiring than a high Gothic cathedral? Not for me, and especially so once mass started and the priest’s singing resonated magnificently, swelling and growing, as only sound in an acoustically sophisticated building can! Look carefully at this picture: The people on the left side are almost to the cathedral entrance. That’s more or less where we got in at the end of the line. 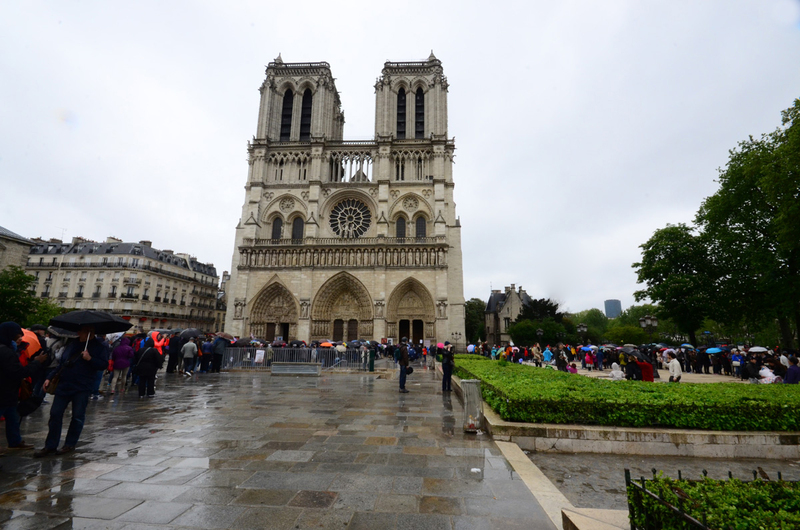 I took this picture when we came out – the people on the right side of the picture are also in line – the line loops around behind me and the current end of the line was all the way back to the front of the cathedral. Joanne and I got separated from Judy and Rod, so we agreed to meet at the back of the cathedral, but we got sucked into a flow of tourists exiting the cathedral and didn’t realize we had left our friends behind until we were outside! With my hackneyed French I talked the guard into letting me go back in through the out door to find them. Good thing, too! By the time we came out line was more than twice as long, reaching all the way back to the end of the plaza and looping back all the way to the cathedral! For lunch, we went to a restaurant near the hotel, fun because we are in a group of friends, but otherwise unremarkable. Indulge me a slight digression here about our hotel, Le Meridien Etoille. It is located apart from the tourist action, near the Porte Maillot (the far west side of the city). 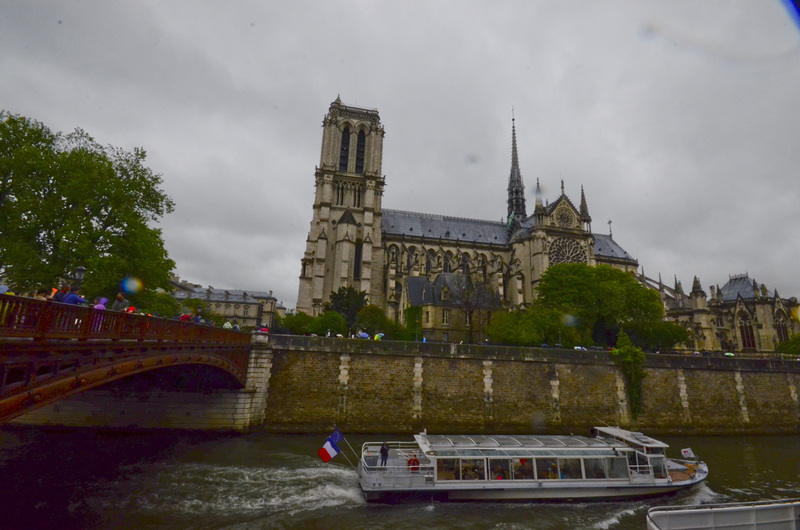 Though this seemed to be a negative thing, our guide, Vincent, pointed out that being away from the major tourist centers meant that our opportunities to experience the Paris of Parisians was far greater than it would be closer in. This actually played out for us. The area behind our hotel has many restaurants frequented by locals. L’Entrecote of the night before was such a place and so was our lunch spot today. View of rainy, foggy Paris from Sacre Coeur. Mid-day we napped and then met again about 5:00 with an evening in Montmartre on the schedule. 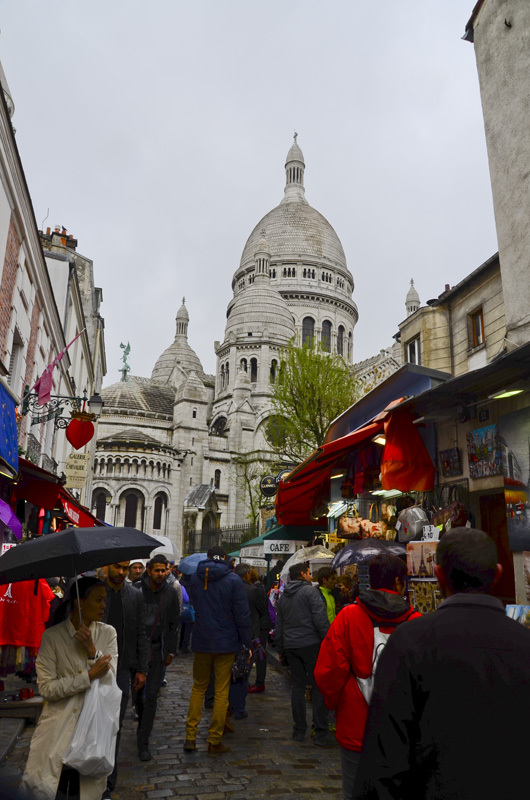 Cindy and Greg opted out (sleep catch up is still their major focus), but Gerry and I shepherded Luis, Joanne, Judy and Rod onto the Paris metro, and through a Metro construction detour, to the Abbesses stop in Montmartre. From here it was a short walk to the funiculaire. We took that up to the square in front of Sacre Coeur, to see an albeit foggy view of the city stretched out below us. Montmartre street with Sacre Coeur in the background. We skipped visiting the church itself and instead wandered the narrow, cobblestone streets with hundreds of other tourists. My memories are of cheerful squares filled with artists doing caricatures or serious portraits, painters selling miniature watercolors of Paris scenes – but those were in short supply. Instead there were lots and lots of schlocky tourist shops all selling the same things, and all selling the same things you could buy near any of the major tourist sights in the city. Add that it wasn’t warm, and you will understand why we ducked into a little wine bar, ordered a bottle and the cheese and charcuterie to accompany it, and whiled away a pleasant hour or so before we packed up and headed down the butte. There are such great memories for me in this neighborhood. Those are memories of a dear friend, Nana de Herrera, who lived on the Rue Lepic, and with whom I had more suppers than I could count back in the summer of 1975. At the base of the butte is the famous Moulin Rouge – Photo op! Then it was back to the metro and “home” to the hotel. The next day we need to get up early to head for our ship. 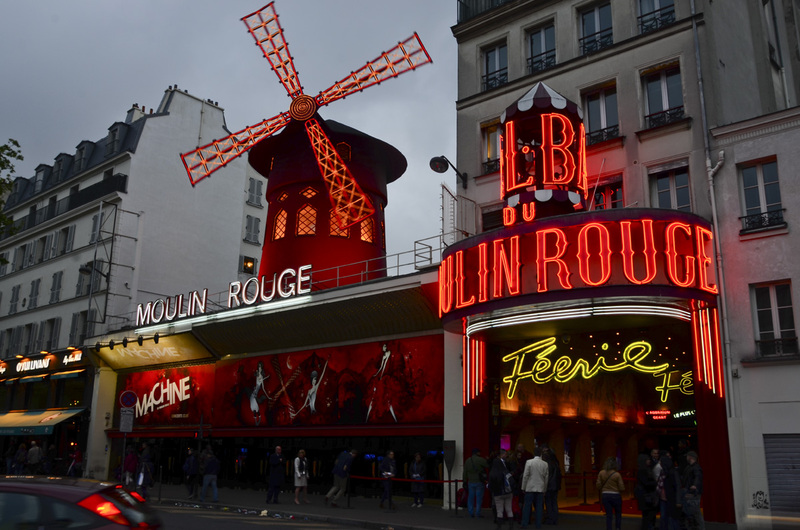 The famous, or the infamous, Moulin Rouge – supposedly the show has been cleaned up. We didn’t find out first hand. Tomorrow, we leave Paris for Luxembourg and finally the boat! Click here to continue reading.